In taking a firm stance against international intervention in Syria, Russia is protecting not President Bashar Assad, but the principles of international law. During the third meeting of the Middle East Section of the Valdai International Discussion Club held last week in Sochi, many speakers argued passionately that departure of the current Syrian leader would create a power vacuum in the country, leading to political chaos and civil war. Many Arab participants expressed genuine surprise as to why Russia was supporting the Syrian head of state and, in so doing, unwittingly complicating its relations with both the new regional leaders and the Arab League. But the Arab experts sidestepped the question of whether the Syrian opposition could be seen as legitimate if it came to power, and they ignored the fact that there is considerable support for President Assad in Syrian society. It looks as if massive well-orchestrated hysteria has taken hold in the Arab world under the slogan “Assad must go.” The Arab participants in the Valdai Club would not discuss who exactly would take power in Syria after his departure or what would happen to the country’s economic and political system. Any facts and figures indicating popular support for Assad were interpreted as false testimony, extracted under duress or through intimidation. The political psychosis caused by the wish of the “Arab street” in the Middle East to continue the revolution impedes contacts between the Damascus authorities and the opposition – the kind of contacts that could be used to start a peaceful dialogue. The absence of an internal Syrian dialogue increases the danger of civil war many times over. Already there is an intertwining of agendas in the Middle East. Against the background of the Syrian conflict, tensions are rising over Iran’s nuclear program, and confrontation between the Shiite and Sunni religious communities is intensifying on all fronts. 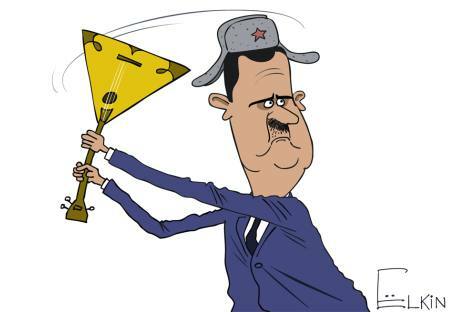 Today, the foreign opponents of the Syrian regime are actively arming the opposition. Fighters may be trained inside Syria or in the Persian Gulf countries. Arms are supplied to Assad’s opponents along humanitarian corridors or across Syria’s porous borders with Iraq and Lebanon. This shadowy intervention is taking the place of direct military intervention by the West or Arab states because Moscow and Beijing oppose any resolutions that might pave the way for such external aggression, and no serious world player would invade Syria without the approval of the UN Security Council. In vetoing the Syrian resolution in the UN Security Council, Moscow was upholding the principles of international law, guaranteeing sovereignty and non-interference in the internal affairs of other states, however well meaning the motives for such interference might be. In Russia’s opinion, ill-considered destruction of post-World War II institutions threatens to throw the extant world order into chaos. That view challenges another view current in international relations, which argues that the changes that have taken place in the world – the “Arab Spring”, the shift of economic centers to Asia, the weakening of Europe and the United States – call for new international laws to take the new realities into account. These laws must allow external forces to intervene in internal conflicts in order to defend the principles of democracy or protect the population from the actions of the existing regime. We have seen this approach in action in Libya and a similar situation is taking shape around Syria. But these new rules of international conduct have not been approved by any international institutions. They run counter to the established principles of international law that Russia and China are upholding. Moscow does not object to changes in the future, but it suggests that they must be agreed upon in advance and not developed or applied selectively to any political regimes the West dislikes. Rejecting the claim that it is supporting President Assad personally, Russia wants to be seen as an impartial broker by all the political forces in Syria. That would give Russian diplomacy a chance to take part in the negotiations on the subsequent fate of Assad and his government and the future political disposition in Syria. And it would be able to prevent a repeat in Syria of the Libyan scenario.